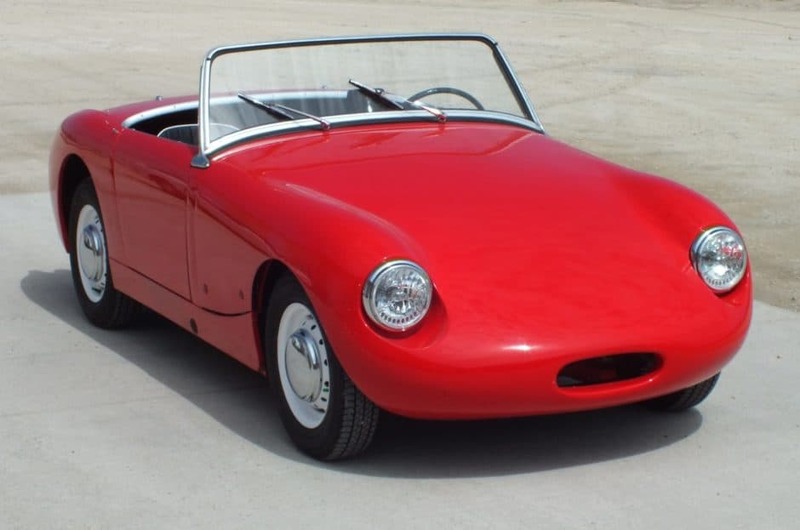 The Bugeyed was the first Sprite ever, designed to serve as a cheap two-seat sports car replacing the MG Midget. It came out in 1958, after not much development since most of its parts were familiar from BMC. However, its chassis was completely unique, as was its styling, dedicated to keeping the car light enough to make it fun with a tiny 43hp 0.9 l engine. And they have made it. The Bugeyed Sprite is the best sold of the Sprites and still a beloved classic car, packed with history and charm and still providing huge fun behind the wheel, despite its far less than neck-breaking performance. 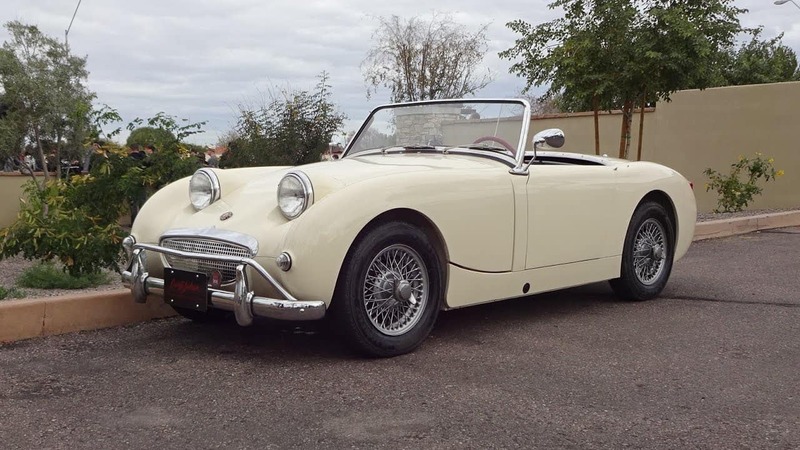 The Bugeyed Sprite (Frogeyed in the UK) was the first small and cheap sports car made by the company after the end of the MG Midget production. The Midget’s roots go back to the 1920s and they went all the way to mid-1950s. This kind of a lifespan stemmed from the immense popularity that the Midgets had had. They were small, lightweight, very cheap and incredibly successful in motorsports, despite the lower power. However, by the 1950s, they were completely outdated in terms of design and other trends, even though the general idea of a cheap and incredibly fun sports car has endured to this day. This is why the Sprite was not so much of a surprise. It was developed to be extremely cheap, but rigid, well-made and fun to drive. The biggest cost-saving feature was the fact that most parts came from the already existing BMC cars. The engine was the I4 948cc pushrod A-Series with overhead valve from Austin. It featured twin SU carburetors and developed not so stunning 43 hp. The suspension and drum brakes were also familiar from the Austin A35 and the transmission had synchromesh for the top three gears. The most modern thing was a unibody construction which made the car rigid enough even without a roof and a blast to corner. Suspension at the front was independent and the rear had quarter-elliptic springs. The most notable feature, of course, is the headlights. Their rounded looks and protruding placement, together with the smiling shape of the grille, made the car incredibly distinctive and have remained its main design feature to this day. However, the original plan was to keep the headlights down when they were off, facing the sky, and to have them pop up when turned on. This design idea was later used on the Porsche 928, but for the Sprite it was dropped in order to lower production costs. Further design peculiarities were the way that the hood was including the complete front body panel in one and lack of the trunk lid. The latter was lacking in order to increase the rigidity of the small roadster and the only way to access the trunk was by moving the backrests of the seats and dive into the hole. Lastly, being a roadster, the Sprite did not need any door handles or locks. It lacked roll up windows and had side curtains, so to open the door, you only needed to reach inside the car. The inside of the car had no carpet, but rather a ribbed rubber mats that are very rare nowadays. Optional features included things like tonneau cover, heater, hardtop and, hilariously, the front bumper. What made this car so desirable, and the most adored of the Sprites today, is its styling, but also stunning steering precision. 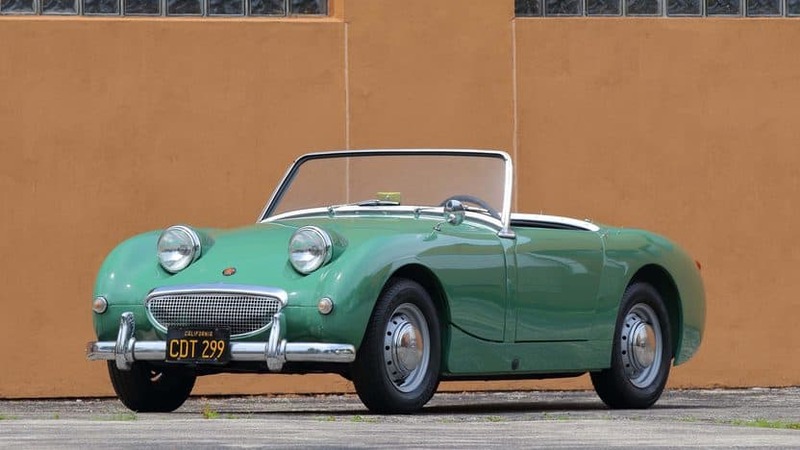 The Bugeyed Sprite was made from 1958 to 1961 when it was replaced by the Mk2 version of the Sprite and it was the most successful car of its bloodline, being sold in 48,987 units. The standard model had the rack and pinion steering familiar from the Morris Minor 1000 and suspension from the A35 and these two worked like a charm with the lightweight body. The Bugeyed was not a fast car, having the 948cc engine, but steering made it a favorite for motorsport racing and enthusiastic driving. If we were to look for a single reason why the Bugeyed is still considered one of the most interesting driver’s cars, it would have to be its steering precision and feel. The stock brakes were drums and the stock engine was an OVH, A-Series, I4, 948 cc machine with twin SU carburetors. It produced modest 43 hp at 5,200 rpm and 71 Nm of torque at 3,300 rpm, which was enough for the top speed of about 83 mph and acceleration to 60 mph of 20.5 seconds. The fuel efficiency was at 36 mpg US. I say “stock” in the previous paragraph when talking about the engine and brakes because loads of Sprites were later upgraded using the same company’s disc brakes and 1.1 l or 1.3 l engines which were evolutions of the one in the Bugeyed. These made the car a lot faster and just a bit heavier. Most Bugeyed Sprites you can find today have been modified and landing your hands on an original one is a tough task. There is not much to say about comfort and equipment of the Bugeyed Sprite. There were two seats with sufficient side support to hold you in place during sharper turns that the Sprite dealt with with ease. The seats, and especially the backrest, weren’t really thick, which was necessary for accessing the trunk, the only way to which was by folding the backrest. The only thing on the transmission tunnel was the gearbox stick. The steering wheel was either two-, or three-spoke with four instruments that kept the design even for the later, bigger and more expensive models by Austin-Healey. The heater was an optional feature, and there were no windows. The car was unique, simple, practical, easy for maintenance, lightweight and fun. Everything else was considered weight-adding burden.